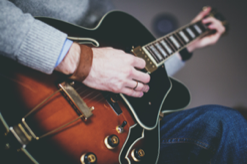 s about making it as easy to learn as possible, but at some point this way of thinkingcan actually hold you back in your musical development and progress on the guitar. The problem with this approach is, that you are not asking yourself any musical questions to develop you musicality such as “what makes a chord” or “why is this C chord a C chord”. Getting into chord voicings is a great way of solving this problem. It will also give you some great tools for making you music sound really professional and beautiful. 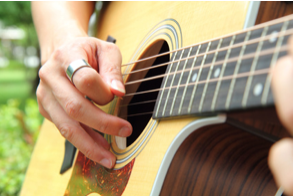 This article gives you some great exercises for you to begin working on chord voicings. Now that you know how to figure out which notes go into which chords, your assignment is this: Choose ten different chords. The chords has to be all major. Using only the three highest strings on the guitar you have to find the three different voicing of each chord on these strings. This will be hard at first, but with a little practice it will get a lot easier. Doing this exercise will give you three different chords shapes depending on which string the root note is placed on. Once you have discovered these it will be very easy to use as you only have to find the root note of a given chord and place your fingers in the corresponding shape. Yo will find that you only need to remember 3 different shapes to be able to lay all the major chords in this way. Assignment 2. This assignment is the same as above, but now you have to do it with the corresponding minor chords. Again you will discover three different chord shapes that corresponds to a particular root note placed on a particular string. Of cause the principles described in this lesson can all be extended to other pairs of strings and to more complicated cords. your overall assignment is to do the exercises and then come up with as many variations on these exercises as possible. The value of this lesson is not in the exercises themselves, but in the principles behind them. This is what you will learn if you actually to the assignment.